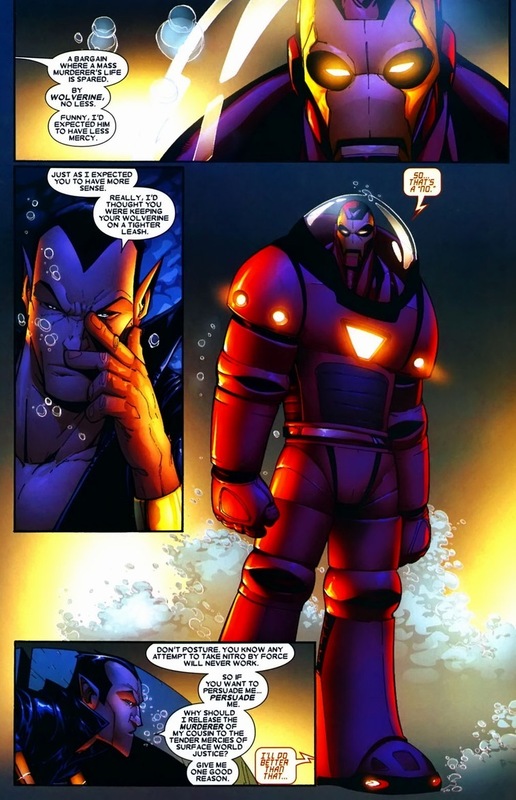 I love Namor, but mainly because I have fantastic taste in anti-heroes. The king of Atlantis reeks of sea water and a vague hint of fish, but he has the strength of the Thing, the self-esteem of Dr. Doom, and can even fly for some reason. Now he’s going to pound on Wolverine. 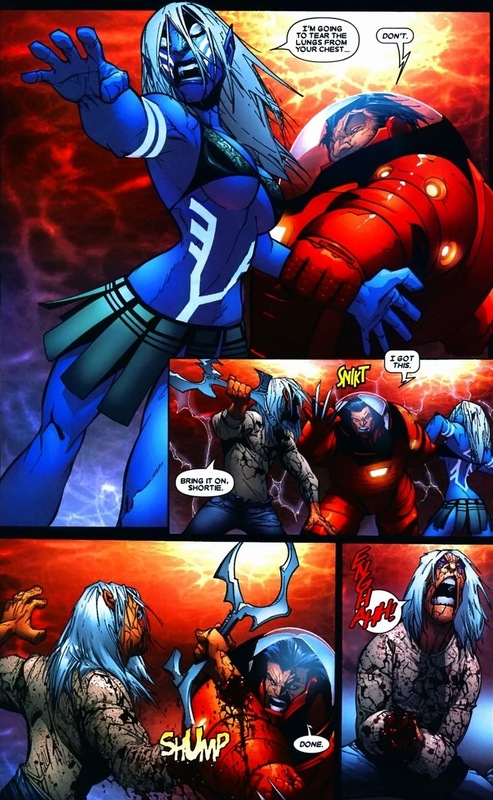 A benefit of fighting the Atlantean king is he’s totally willing to banter. 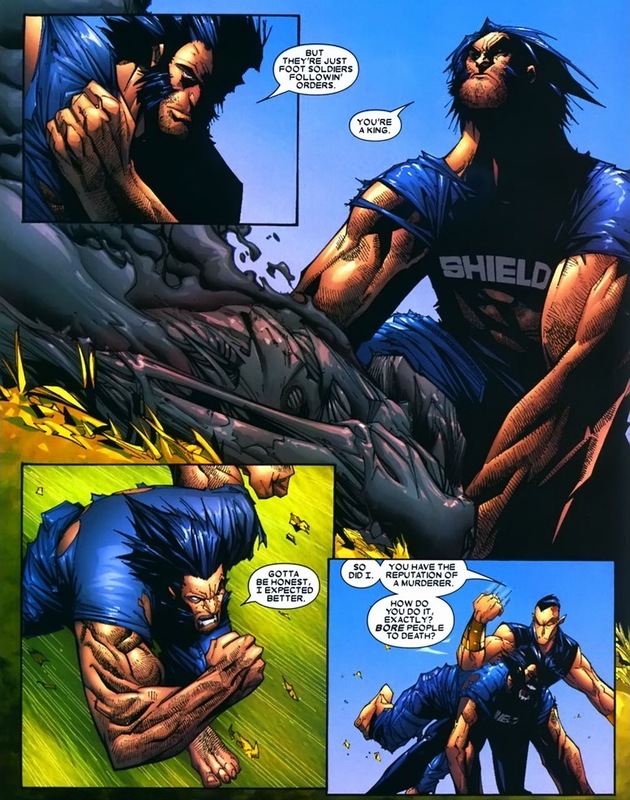 And thank goodness Wolverine found some clothes. There’s no pride in taking down a naked opponent. 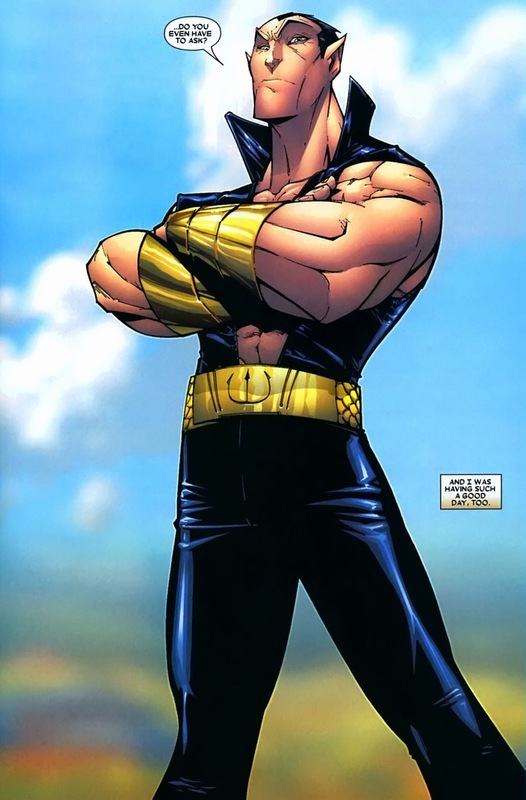 Though remember Namor’s original costume of just a speedo and bracelets? I’m just saying it’s hard to be taken seriously as royalty when you look like a grumpy European tourist. 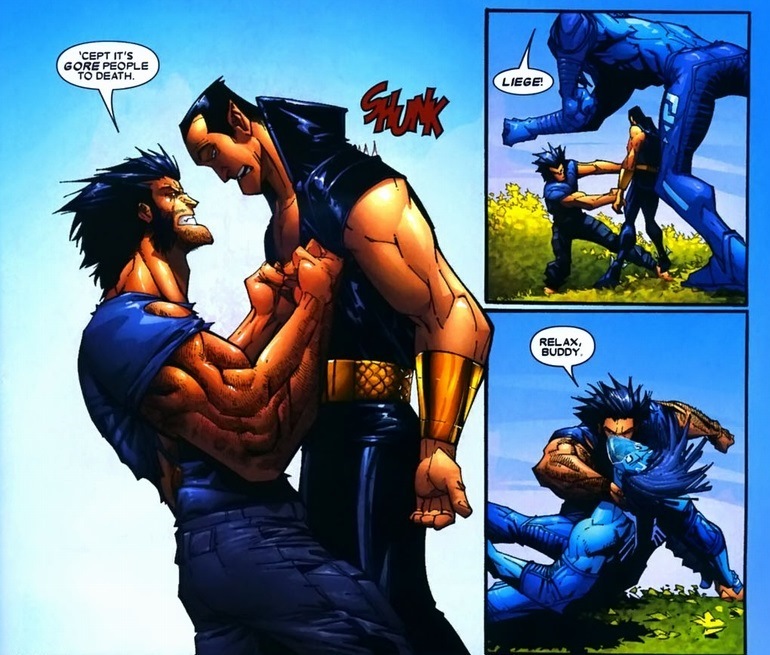 While Namor can shrug off the mightiest punches, the same can’t be said for adamantium claws. 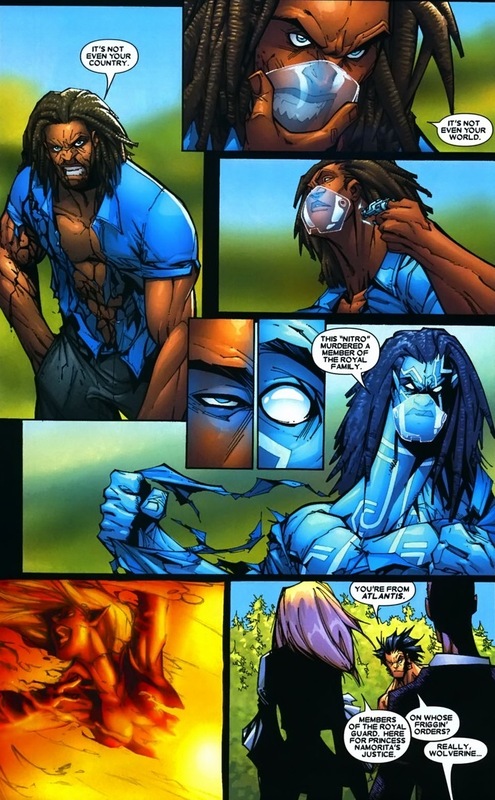 I don’t think people know the limitations of Wolverine’s abilities. He’s really not that strong. Or fast. Or durable. Or likable. Spider-Man, for instance, can lift a good five times what Logan can, and would easily take him down in a one-on-one basketball game — if that’s how you settle superhero disputes, I guess. But a hundred years of being shot, stabbed, punched, incinerated, etc. 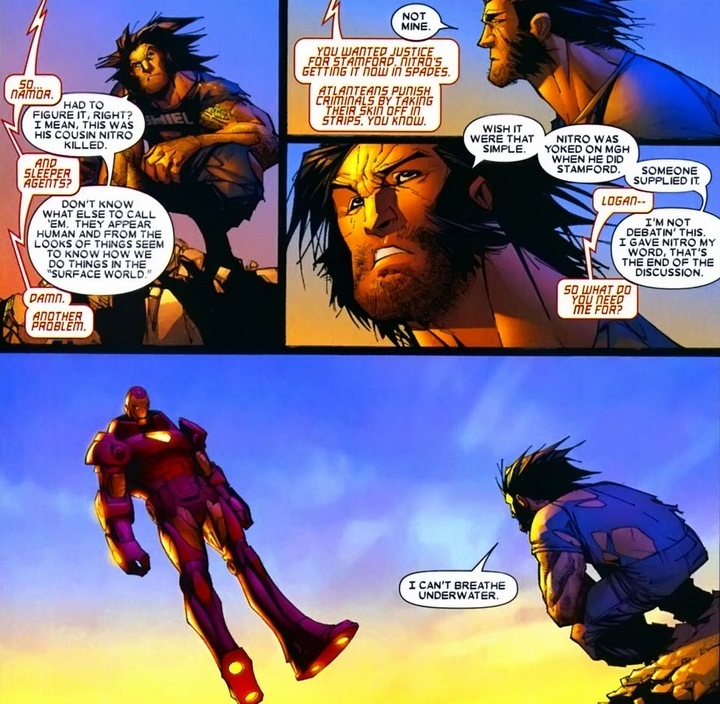 have given Wolverine a persistence unmatched by any other Marvel character. Plus, he’s not that busy right now. 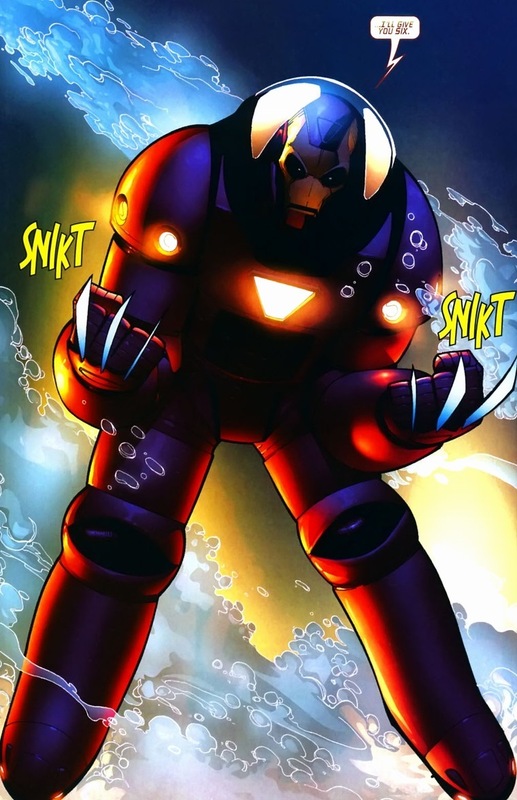 Unfortunately, Nitro currently resides in Atlantis, where Wolverine’s swimming skills would be sorely put to the test. Oh, this arc goes far deeper than a Nitro chase. You get hidden drug dealers, a corporate scandal, and lots more clawing that we’re not going to get to. But we’ll cover the Nitro chase at least. Time to negotiate with the ocean’s most frustrating ruler. Spoiler alert: that’s not Iron Man. But it does set up for a charming one-liner. Round two goes as you think. 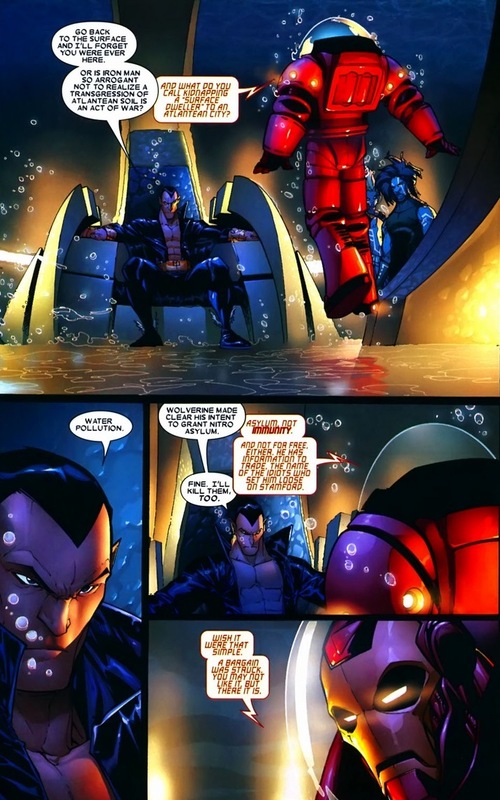 Wolverine’s fighting Namor in the king’s natural habitat while Wolverine wields a slow, cumbersome suit of armor. Luckily, the fight gets interrupted — the Stamford killer causes a ruckus. Awesome, right? Spider-Man would have webbed his hand shut or something, but slicing it off sends a much more powerful message. Like, maybe mass murder isn’t as lucrative a career choice as previously thought. 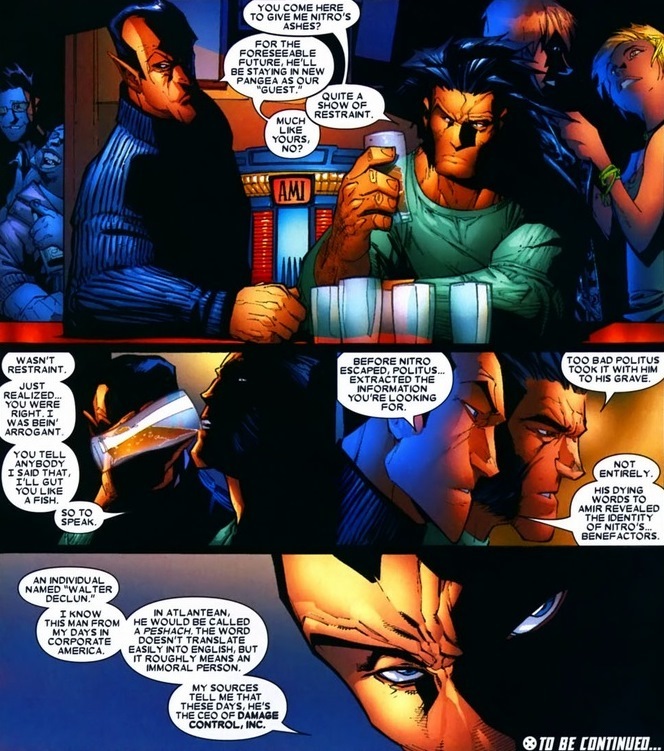 No, Wolverine’s not maturing. It’s just that after all the horror that happened the past few days, Wolverine realizes that he doesn’t really have a dog in this fight. 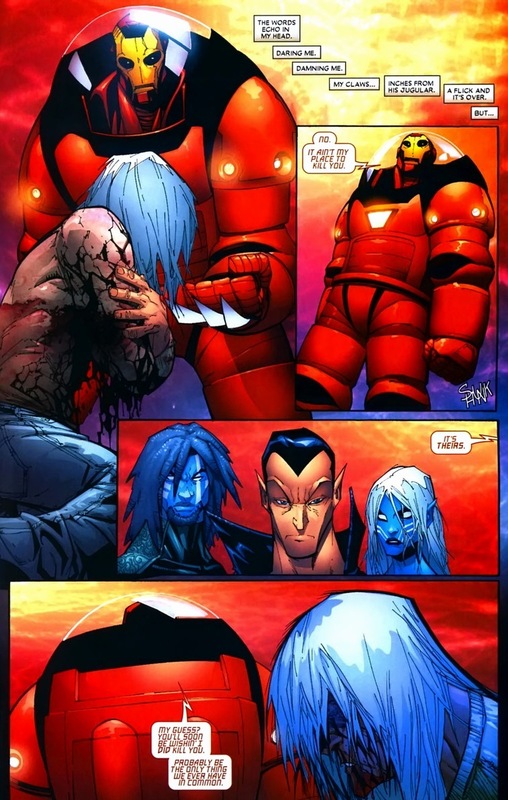 Sure, Nitro has to pay for massacring 600 people and most of the New Warriors, but Namor and gang? 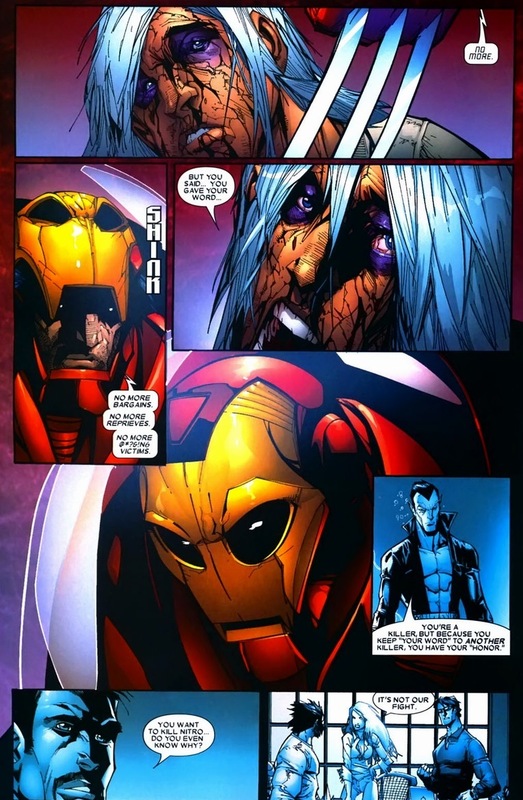 Their vendetta stretches far greater than Wolverine’s ideals. 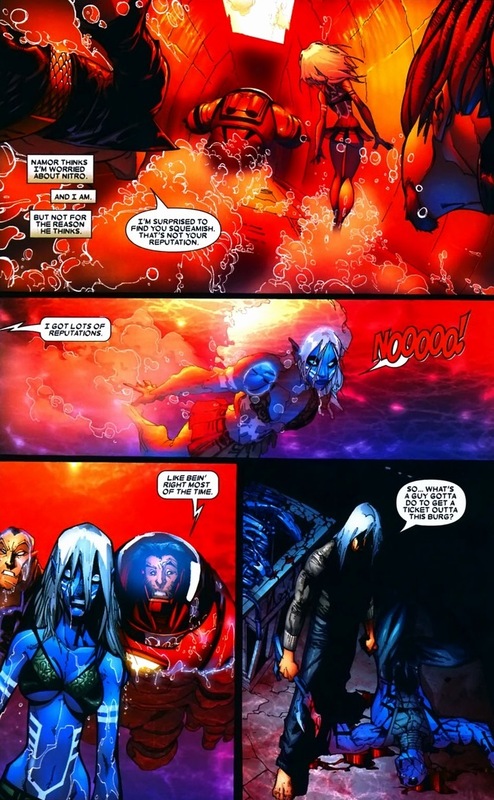 Plus, and this may be the most important detail — no one tortures like the Atlanteans. Mephisto himself shudders in the deepest corridors of Atlantean prisons.